Baked or grilled Hasselback potatoes are a crispier, flavorful alternative to baked potatoes. Potatoes are cut into thin slices partway through the potato so that slices are held together at the base of the potato. Hasselback potatoes cook faster and can also be loaded with your favorite baked potato toppings. 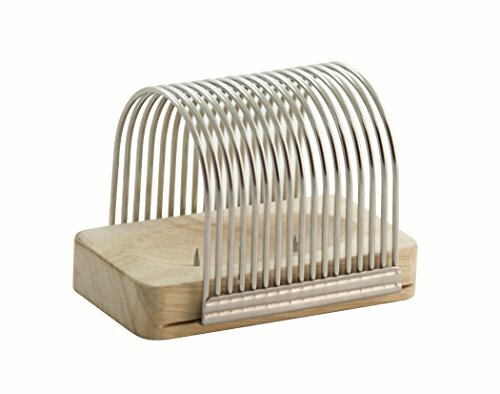 This Hasselback Potato Rack will help you achieve perfectly spaced cuts without accidentally slicing through the entire spud. Place your potato on the wooden dish, pushing it onto the nails in the center so that your potato is held in place. Use your knife to make cuts through the stainless steel guide wires. When you're done, slide the cutting guide off & cook your prepared potato with your favorite recipe. HOW TO USE: Slide the two-piece of the rack apart. Place your potato on the wooden dish, so that the two small nails in the center pierce the bottom of the Potato. Insert the metal cutting guide into the slot on the sides of the wooden dish and slide over your potato. Take a large knife and insert it in between the metal guide wires, cutting down and through the potato until the knife's blade reaches the wood base. The potato will not be sliced all the way through. Repeat until the entire Potato is sliced. Slide the cutting guide off, remove the potato from the wooden dish, and cook according to your recipe. CARE: Stainless steel cutting guide is dishwasher safe. Wood dish is not dishwasher safe; wash with mild dishwashing soap, rinse, and dry immediately. Periodically apply mineral oil to condition wood. CAUTION: Not meant for use on or near heat source. Wood piece will burn. Use precaution with regard to nails in wood dish, & when using a knife to cut within the guide.